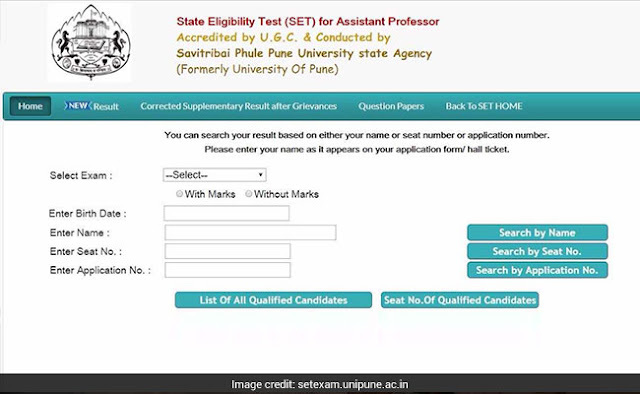 Maharashtra SET 2017 Results: Savitribai Phule Pune University(SPPU) the conducting body of State Eligibility Test (SET) of Maharashtra and Goa, has declared the results of the SET 2017 Today at the official portal, unipune.ac.in. SPPU had successfully conducted the SET 2017 exams for both the states(Maharashtra & Goa) on 16th April 2017 to appoint various stream assistant professor jobs.The candidates who had attended the examination can check their results by following the instructions. Click on MH SET Results 2017. As per the official notification, SPPU will not issue any mark sheet to the candidates. Certificates will be issued to the qualified candidates only after the verification of documents that will follow after one month of result declaration. The qualified candidates need to submit the necessary documents duly attested, along with their application form, within one month from the date of declaration of result.